Foot, Richard and Daniel Latouche. 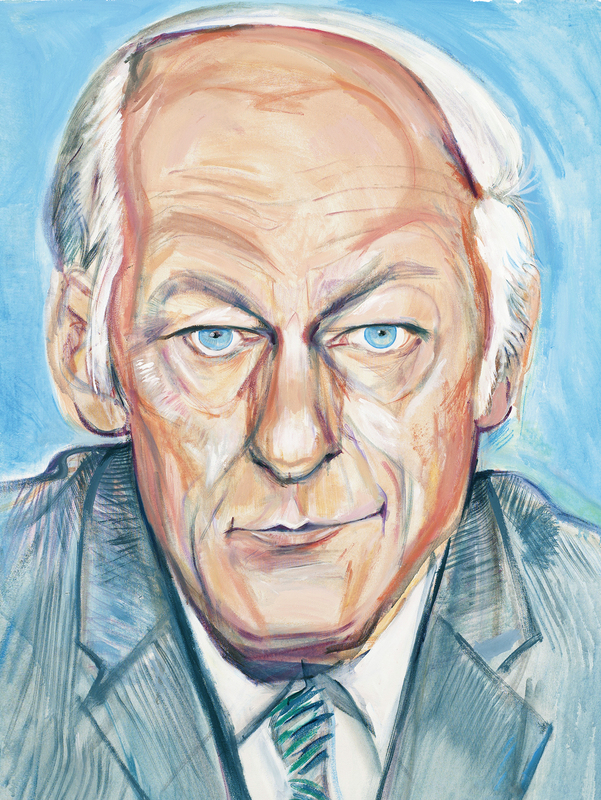 "René Lévesque". The Canadian Encyclopedia, 10 September 2018, Historica Canada. https://www.thecanadianencyclopedia.ca/en/article/rene-levesque. Accessed 24 April 2019. 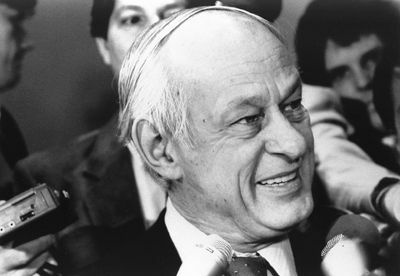 René Lévesque, premier of Québec 1976-85, politician, journalist, nationalist (born 24 Aug 1922 in Campbellton, NB; died 1 November 1987 in Montréal, QC). René Lévesque, premier of Québec 1976-85, politician, journalist, nationalist (born 24 Aug 1922 in Campbellton, NB; died 1 November 1987 in Montréal, QC). A prominent member of Jean Lesage's Liberal Cabinet during the Quiet Revolution, Lévesque later founded the Parti québécois (PQ), eventually bringing it to power in 1976. The PQ's main objective was Québec independence, and for 15 years Lévesque was the leading champion of that ideal — holding and losing the province's first referendum on sovereignty in 1980. Lévesque grew up in the remote, coastal town of New Carlisle, among the fishermen and farmers of the Gaspé peninsula. Because there was no hospital there in 1922, he was born in nearby Campbellton, New Brunswick, the eldest child of Dominique Lévesque, a prominent lawyer, and Diane Dionne. Although the Lévesques were well-to-do, poverty was dire in the Gaspé at that time. René became aware at a young age that most of the French Canadians were poorer, with smaller homes and more wretched schools, than the English Canadian families — descendants of Loyalists who had fled the American Revolution — who were the self-appointed elites of the region. A bright student who impressed his Jesuit teachers, Lévesque resolved early on at the Séminaire de Gaspé that he was destined to be a leader. He idolized his father, who introduced him to politics, and to French and English literature — giving the boy a bilingual upbringing. When Lévesque was 14, however, his father died in hospital at the age of 48. His mother quickly remarried, the family relocated to Québec City, and Lévesque drifted away from both his family and his studies. Expelled from the Collège des Jésuites Saint Charles Garnier for low marks, he finished his formal schooling at the Séminaire de Québec and enrolled in the law school at Université Laval, but gave up on his studies before obtaining a degree. Lévesque had discovered radio journalism in 1938, his last summer in New Carlisle. In Québec City he worked at CBV, a regional Radio-Canada station. When the Second World War broke out, he was keen to get into the action, not as a soldier but as a war correspondent. Radio-Canada refused to send him, so in 1944 Lévesque found a position in London with the French section of the United States government service, Voice of America — thereby avoiding conscription by the Canadian military. He didn't get to the front lines until February 1945, joining the American armies as they crossed the Rhine and swept through the devastated remains of Germany. He was among the first US correspondents to see the horrors of the Dachau concentration camp following its liberation. The war instilled in Lévesque a fondness for Americans (versus English Canadians), and a deep awareness of the barbarism that can flow from the extremes of nationalism. It wasn't enough to erase his own nationalist impulses, but it did temper them; he was committed throughout his life to democracy. After the war Lévesque returned to Radio-Canada, becoming an announcer for La voix du Canada, a news program broadcast out of Montréal to French-speaking countries around the world. He quickly established himself as an engaging and widely-followed foreign newsman, reporting from the Korean War in 1951 and the Soviet Union in 1955. From 1956 he hosted the television series "Point de mire" (Focal Point) and became one of Québec's most influential TV commentators. Short, balding and chain-smoking, Lévesque lacked the good looks for this emerging visual medium, but his intelligence and wit, and his ability to explain world events to a domestic audience, enabled him to become one of Québec's first TV stars. In 1947, Lévesque married Louise L'Heureux, his fiancée from before the war, with whom he wouldhave two sons and a daughter. Surrounded by admirers in the broadcasting world, Lévesque wasn't a faithful husband, and the couple would divorce in 1978. In 1959, Lévesque became actively involved in a strike by Radio-Canada producers, who wanted to form a union. He was dismayed by the indifference of the Diefenbaker government in Ottawa, and of his English CBC colleagues, towards the strikers' goals, which only hardened his views towards English Canada and fuelled his political aspirations. He decided journalism wasn't enough — it was time to stop covering the world, and start changing it instead. Lévesque joined Jean Lesage's Liberals in the provincial election of 1960, becoming a Member of the Legislative Assembly for Montréal and helping to defeat the old Union nationale government. It was the beginning of the Quiet Revolution, and Lévesque became one Lesage's most popular and energetic Cabinet ministers — helping to modernize Québec, to encourage its French-speaking majority to become "masters in our own house," and to help ease the province away from the oppressive influence of the Roman Catholic clergy. After a brief stint as minister of water resources and public works, in which he fought corruption in the civil service, Lévesque was appointed minister of natural resources in 1961. He became point-man for the controversial but ultimately successful effort to nationalize the province's private electric utilities and fold them into what became the energy colossus of Hydro-Québec. If Francophone Québecers didn't own or control big business interests in their province, Lévesque insisted, they would at least control its vast natural resources, via their government. In 1966, the Lesage government was defeated and Lévesque — increasingly nationalistic, and critical of his party's relations with the federal government — quit the Liberals the following year to found the Mouvement souveraineté-association, which in October 1968 became the Parti québécois. The move was hardly surprising. Through the 1960s, even as a Liberal minister, Lévesque had made his views on independence increasingly clear, telling the Anglophone media in Canada that he wouldn't be upset if Québec separated. At the 1967 Québec Liberal Party convention he had even tabled an incendiary resolution, largely unsupported by other delegates, titled "A sovereign Quebec within a Canadian economic union." Meanwhile, he grew increasingly antagonistic with Pierre Trudeau, who entered federal politics in 1965 advocating a very different vision. Having managed to unite the various groups promoting independence and a new political status for Québec, Lévesque's party won 23 % of the vote in the 1970 provincial elections — although he himself failed to win a seat. Then the October Crisis erupted, and Trudeau, now prime minister, invoked the War Measures Act. Lévesque joined a coalition of prominent Québecers in condemning what they saw as Ottawa's anti-democratic response to the crisis. At the same time, Lévesque and his friends failed to unequivocally condemn the terror kidnappings of the Front de libération du Québec (FLQ) and the group's subsequent murder of Pierre Laporte. This allowed the PQ's critics to publicly equate the party with the FLQ, costing the PQ considerable support. In the 1973 provincial election the Liberals won a landslide victory, and Lévesque once again failed to win himself a seat. The PQ, however, managed to become the official Opposition. In the next election, in 1976, Lévesque and his party faced off against the now-unpopular Liberal regime of Robert Bourassa, weary after years in power and beset by scandal and accusations of nepotism. Lévesque promised good government. He also downplayed the PQ's essential goal — sovereignty — while reassuring Québecers that a PQ government would commit to holding a referendum on the issue first, rather than declaring sovereignty unilaterally. The PQ won a majority of 71 seats, including one for Lévesque, who became the province's 23rd premier. He headed the first Québec government committed to breaking up Confederation. The rest of Canada was stunned. During its first term, the new government passed several progressive measures concerning automobile insurance, rezoning of agricultural lands and the abolition of secret electoral funding. One of the most important and controversial pieces of legislation was Bill 101, the Charter of the French Language, which formalized the status of French as the official language of Québec. Proclaimed lawin 1977, Bill 101 excluded English from the provincial legislature and courts, and restricted access to English schools to anyone other than children whose parents had attended English schools in Québec. French schooling became compulsory for English-speaking immigrants, even those from other Canadian provinces. Although strongly supported by the public and the PQ, the law triggered an exodus of more than 130,000 Anglophones from the province between 1976 and 1981 . As well, a number of Montréal-based companies, including Sun Life Assurance Company of Canada, relocated their head offices to Toronto. In the ensuing years, court rulings would strike down many of the law's measures as contrary to the Constitution, including the ban on English in the legislature and courts. Eventually, children whose parents had attended English schools elsewhere in Canada, were allowed into English schools in Québec. In the fall of 1979, as time was running out on his government's mandate, Lévesque finally introduced in the National Assembly a plan for sovereignty-association — a politically independent Québec, still economically tied to Canada. A referendum on the question was scheduled for 20 May 1980, only months after the defeat of Joe Clark's Conservatives in Ottawa, and the return to power of Lévesque's nemesis Pierre Trudeau. After an emotional campaign led on the "non" side by Liberal Opposition leader Claude Ryan and federal Cabinet minister Jean Chrétien (with key support from Trudeau), and on the "oui" side by Lévesque and his ministers, the sovereigntists won only 40 percent of the vote, failing to capture even a majority of the Francophone vote. It was the hardest defeat of Lévesque's career. If there was any consolation, Lévesque believed the vote had at least legitimized the right of Québecers to determine their own future regarding Confederation. Ottawa had recognized that fact through its active participation in the campaign. Against all expectations, the PQ was re-elected in 1981, with Lévesque heading his second majority government. The party may have been helped at the polls by the emergence of new battle lines pitting Lévesque and other provincial premiers against Trudeau, who had announced his intention to repatriate the Constitution from Britain and to proceed unilaterally if the provinces opposed him. Trudeau had made the vague promise, during the 1980 referendum campaign, of "renewing" the Constitution. Now his government was proposing new, centralized federal powers over the economy, a constitutionally-entrenched Charter of Rights and Freedoms, and a new constitutional amending formula. After months of political debate and grandstanding among Trudeau, Lévesque and the other premiers, the First Ministers, as they were called, assembled in Ottawa in November, 1981, in a final bid to settle their differences. Lévesque was one of several powerful and strong-willed premiers (along with Alberta's Peter Lougheed) — together comprising eight provinces, or the Gang of Eight — who opposed Trudeau's plans and had fought them through the courts. But huddled together in Ottawa that November, the seven English-speaking premiers in the coalition were won-over by the promise of a "notwithstanding clause" in the new Charter — limiting its power over provincial authority. The compromise was not enough for Lévesque, who had also insisted on constitutional recognition of Québec as a "distinct society," and on a constitutional veto for Québec. He accused his fellow premiers of abandoning "Québec at the moment of crisis." With the agreement of nine provinces, Trudeau pressed ahead. The repatriated Constitution was signed by Queen Elizabeth in the spring of 1982 — with the support of all the premiers except Lévesque, whose government represented the second-most populous province in the country. It was a detail that would bedevil the country and its First Ministers for years to come. Lévesque returned to the National Assembly to face the hard task of governing. Confronted with economic recession and spiralling provincial deficits, his government met with considerable opposition and public disapproval, including illegal public-sector union strikes, when it attempted to reduce spending to solve its grave financial problems. There was also turmoil inside the PQ and growing doubts about Lévesque's leadership. In 1984, a party crisis erupted when Lévesque announced his intention of not fighting the next election on the issue of independence, while maintaining sovereignty-association as the party's official raison d'être. Several important ministers resigned in protest, but the party reaffirmed Lévesque's leadership at a special convention in January 1985. Still, exhausted by years of struggle — and the defeat of his fondest political goals — Lévesque, at 62, fell into depression and was even hospitalized against his will. In June 1985 he resigned as premier. Lévesque enjoyed two years of retirement, before his heart gave out on 1 November, 1987. In that time he wrote his memoirs, which proved hugely popular. Upon his death, he was remembered across the country, by friends and foes alike, as a giant of Canadian politics. Lévesque's mark on Québec, and Canada, is as indelible as any leader that province has produced: as a journalist he opened the minds of Francophone Québecers and awakened them to the wider world; he was a central figure of the Quiet Revolution; a creator of the energy powerhouse that became Hydro-Québec; founder of the PQ and leader of Québec's first openly separatist government; the angry, intransigent torch-bearer of the "distinct society" ideal, who refused to endorse the 1982 Constitution, leaving an open wound in the federation that festers still. Through it all, Lévesque acknowledged that whatever injustices Québecers suffered inside Confederation, Canada was still a free and decent country. "Canada's federal system," he once said, "is not excessively oppressive or anything like a gulag." He was never the most ardent nationalist or separatist of his time, yet he fanned the flames of nationalist sentiment in pursuit of his aims. His insistence on wanting to break up the nation, in spite of the Canadian virtues he admired, are what made him such a perplexing — and often hated — figure in the minds of English-speaking Canadians, both inside Québec, and elsewhere. P. Desbarats, René: A Canadian in Search of a Country (1976); G. Fraser, P.Q. : René Lévesque and the Parti Québécois in Power (1984); R. Lévesque, Memoirs (1986). La loi 101 (I): Le malaise de René Lévesque Radio-Canada nouvelles histoire de la relation entre René Lévesque et Camille Laurin. Separatism gets a leader with René LévesqueWatch vintage CBC News stories about René Lévesque advancing the case for a sovereign Québec. Le Mouvement souveraineté-associationReportages sur le Mouvement souveraineté-association par Radio-Canada. René Lévesque explique le Québec aux FrançaisRené Lévesque sur le statut de la langue française au Québec par Radio-Canada. René LévesqueUne notice biographique de René Lévesque, ancien premier ministre du Québec. Par le site Web de l'Assemblée nationale du Québec. Extraordinary Canadians: René LévesqueA synopsis of a revealing biography of René Lévesque, former journalist and premier of Québec. From indigo.ca. The French Language in Québec: 400 Years of History and LifeAn extensive history of issues, events, and legislation related to the status of the French language in the province of Québec. Search this title for additional online sections of this document..From the website for the Conseil supérieur de la langue française. René LévesqueUne biographie de René Lévesque, journaliste, homme politique et auteur. Par le Dictionnaire biographique du Canada en ligne. René LévesqueA biography of René Lévesque, former premier ministre (premier) of Québec (in French). From the official website for the Assemblée nationale du Québec. René LévesqueA review of Daniel Poliquin’s biography of René Lévesque from The Globe and Mail. René LévesqueAn obituary for former Québec premier René Lévesque from montrealgazette.com. Genèse de la Loi 101: le malaise de René LévesqueUne analyse du projet de loi 101 et la relation entre René Lévesque et Camille Laurin. Par lapresse.ca. René LévesqueA biography of René Lévesque, journalist, politician, and author. From the Dictionary of Canadian Biography Online.